Busy with work, I was looking for something simple to make, yet full of interesting flavors, not too heavy, and would go well with a nice bottle of Lagunitas Maximus beer. A friend of mine had read my post recommending cookbooks for the holiday season and he brought up a book I had perused but hadn't purchased, Stephane Reynaud's, "Pork & Sons". I picked up the book over the holidays and fell fast for it. Reynaud educates the reader on the annual tradition of the pig kill in France. The book is filled with beautifully photographed food and interesting and entertaining musings on the rich history of this rustic tradition. The book covers the pig nose to tail and like another book close to my heart, Martin Picard's, "Au Pied De Cochon - The Album," it demonstrates a deep respect for the animals and how they are raised through the methods of their slaughter. It's basically a celebration of all things porcine, containing recipes that act more as guide than ones set in stone, allowing room for improvisation and substitution. There are recipes ranging from sausages, charcuterie, roasts, salads, and a great section on offal, which most Americans are averse to, yet we should learn to appreciate more out of respect to the animals that we eat. Waste not, want not. 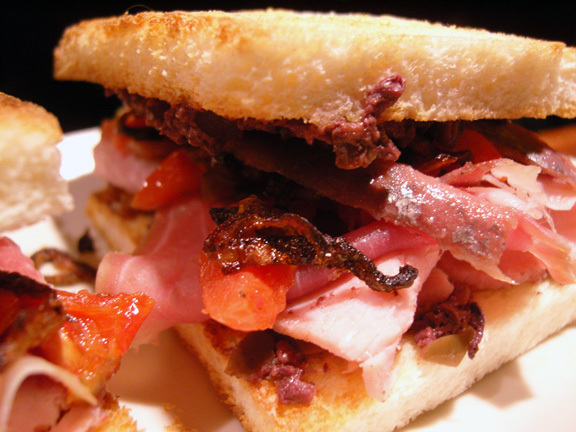 While flipping through the book, a recipe caught my eye immediately, a sandwich layered with ham, prosciutto, anchovies, sun-dried tomatoes and black olive tapenade tucked between two toasted slices of crustless white bread. I'm a sucker for anchovies, so I had to make this sandwich. They add such a nice touch when combined with certain meats, but that's for another time. My bottle of beer had found its companion. I adapted Reynaud's recipe for two people and made some small changes. It calls for Jambon de Paris, which I couldn't procure without driving all around the city, so I used some wet-cured, unsmoked sliced ham. Plus, I am trying to buy locally produced meats as much as possible. Jambon de Paris is basically the square loaf fully-cooked sandwich ham that most American kids were familiar with, but of a higher quality. (Much the same as Chipped Ham, for those of you from the Pittsburgh area, yet sliced thicker) There are local producers, but it's not something widely available, but almost any good quality sliced ham could be substituted. Another thing I changed was to use shallots instead of onions. That was just a personal preference. In addition, I used some really nice oven-roasted tomatoes I had in the fridge instead of the sun-dried ones in the original recipe. Sun-dried would work as well. The recipe has instructions for a quick tapenade without anchovies, but in the name of ease, I used a jarred tapenade that I had on hand. Good olive tapenades are so easy to find nowadays and so useful, I always seem to have a jar in the fridge or pantry. I used some nice salt packed anchovies from the deli section at our Whole Foods. For prosciutto, I used the buttery luscious, La Quercia Rossa - Heirloom Breed Culaccia. 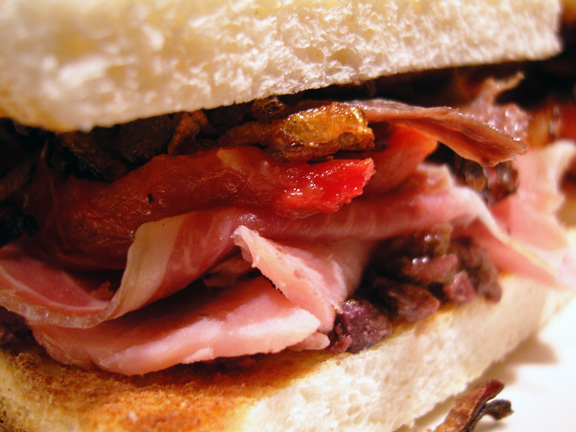 The La Quercia Prosciutto Americano is amazing and would work just as well. La Quercia is a small earth-friendly artisan meat company located in Iowa. They use humanely raised animals and cure using traditional methods instead of using nitrates, nitrites or vegetable derived substitutes. I highly recommend searching out their products and supporting this great company. I've been a big fan of the Northern California, Lagunitas Brewing Company for a long time. Their Maximus is one of my favorites. They describe it as an "IPA Maximus," but it probably falls more into the somewhat disliked label of "Extreme Beer" than an IPA. I'm going to call it a Double IPA, because at 7.5% abv, I feel it's a little low in alcohol to call it an Imperial IPA or Triple IPA. I guess Extreme Beer is just as easy a name because it's simpler to remember and it seems to encompass all those other labels. Maximus is very aggressively hopped, so, it's not for the faint of hops. It wears it's bitterness like a badge of honor. Surprisingly, it maintains a shimmer of a malt balance, though the piney and grapefruity hops keep lingering on. There is definitely some nice sweetness that comes out as the beer warms a bit. Not a beer for everyone, but that's okay. That's what makes life fun. We're all different. Plus, there'll be more for me. A perfect light fulfilling dinner or an elegant beer snack. However you may look at it. 1-2 slices jambon de paris (basically, unsmoked ham, sandwich ham) - any kind of wet cured will work. Pan fry the shallots in butter or olive oil. Don't let them burn or they'll become bitter. Slowly fry them till their golden. Remove them from pan onto paper towel to drain. Toast the bread. Spread tapenade on one side of each slice. 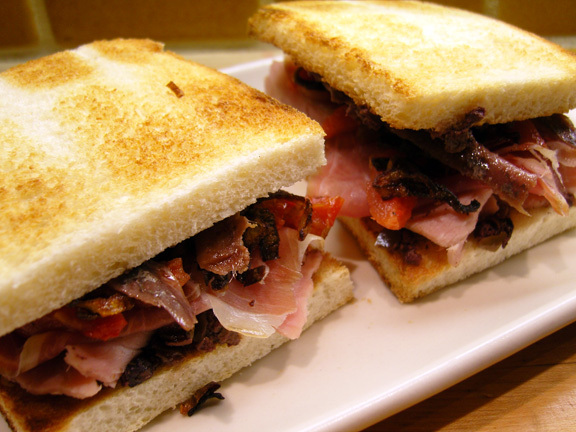 Layer the ham strips on top, then the prosciutto, tomatoes, fried shallots, anchovies and finally the other slice of toast. I love this recipe. BTW, you had me at "Lagunitas". 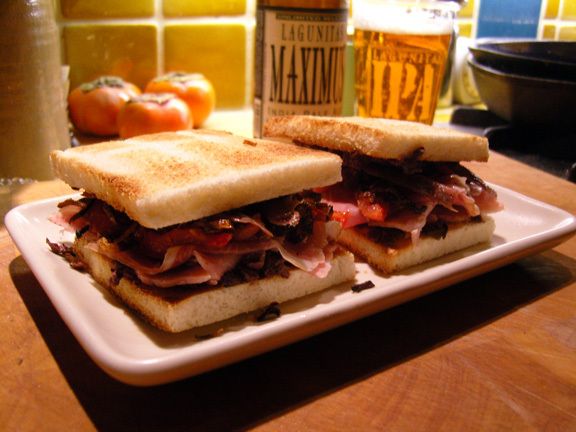 Nothing like pairing a proper sandwich with a proper beer. Your photography throughout is nice, too. Keep up the good work.